At Standard Cleaning Services we have some priorities. Our first priority is to YOU, our customer. We strive to be good listeners and good communicators with you, our customer. We listen to what your needs are and communicate how we can help. We are experts in all phases of cleaning. We go above and beyond towards the WOW factor. Your business is important to us and we mean to prove it. We work on an hourly basis and feel that is the fairest way to meet your expectations. 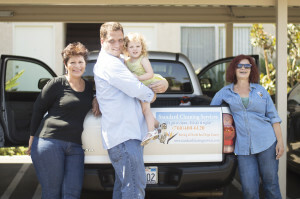 We clean all of North San Diego County and we are never in a hurry, just the opposite, we are focused, fast and efficient. We bring all of our own cleaning supplies because we know what works best. We use high quality products and equipment which we provide, we only use microfiber mops and cloths. Our first priority is to do no harm, we will never use abrasive cleaners on the wrong things. We do not cross contaminate between jobs. We believe in saving the environment by using green cleaners whenever possible, it's healthier for you and for us too! When we do regular cleanings we group like things together into categories and give everything a home? We fold clothes, towels, match socks, make beds and organize where and when we can. If you are behind on things at home. let us help you. We help to keep things running smoothly by performing the basic duties required to do so. We know that climbing into bed with clean sheets is a luxury and our thoughtfulness does not stop there. We think that when you walk in the door things should be neat and clean! Of course there are some areas that are off limits, we are careful around your paperwork and personal things. We want you to say wow when you walk in the door because a clean home should not only be clean but should smell clean too. We use organic cleaners when we can and that is mostly on the floors, it’s safer for you, your children and your pets. And, did we mention we love pets?